You knew another fabulous aluminum foil project was coming, right? 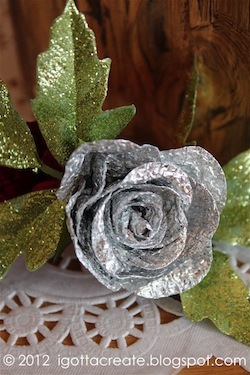 Great for Mother's Day or Valentine's Day: A thornless Silver Rose. For the rose, you'll want three sizes of circles. I used the following round punches: 1", 1-1/4" and 1-3/8." Punch 4 or 5 circles of each size out of your Tinfoil Waffle Cloth. Now you're ready for the Spring version of the Tinfoil Craze! Using the smallest circle, roll a tight tube for the center. Then create 3 or 4 slightly looser cones, building up the center bud of your rose. A glue gun is a most indispensable tool! I tell you all about mine in "A Gal's Gotta Have A Glue Gun." Now, for your outer petals, use the largest circles. Instead of making a smooth cone, pinch the bottom a bit to create a little "gather" in your petal. See how the 'gathered' petals turn it into a blooming rose? 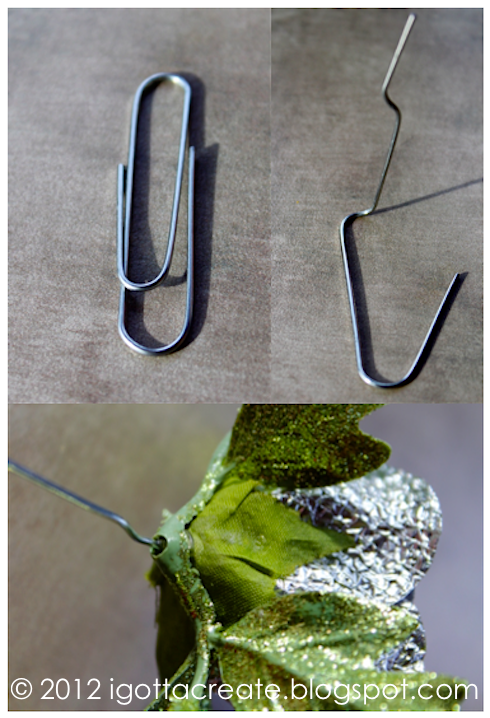 I opened a large paper clip and poked it into the base of the rose in order to make it stand upright. This is a very basic and fun way to create a stem and display your rose. It would be fun on your desk. But of course, I have other plans for this beauty. Follow me and stay tuned! How cute! What a great project, thanks for sharing. I'm visiting from Tatertots and Jello's linky party. Amazing! It's so pretty. Love the texture. I just found you through the Funky Junk Linky party and love your roses. I would love to merge your roses with the chandelier that I made this week - they'd be like peanut butter and jelly! You'll have to check it out. Anyway thanks for sharing - I am inspired for my next lighting project now! That looks great Christina. It could be used for so many different things. You are the QUEEN of tinfoil. Wow! This is really beautiful! This is gorgeous! Thanks so much for the very informative tutorial too. Very nice! Christina, you are most definitely the queen of tinfoil! The roses are beautiful! So pretty! And yes, I knew another great foil idea was coming since the amazing rickrack I still have to try-love this for Valentines cause I"m not a red/pink person-great job! Wow! Those are really pretty! Ok, you have been officially anointed the tinfoil queen. Seriously do you wake up at night with "tin foil" memories? You projects are always so great! Thanks for sharing your inspiration at Sunday's Best! Oh wow! What a great flower - I have to look at your other tin foil ideas too! That is so adorable! Okay you are officially the tin foil queen! I've never seen anyone else make such cute stuff from tin foil! That is so beautiful. 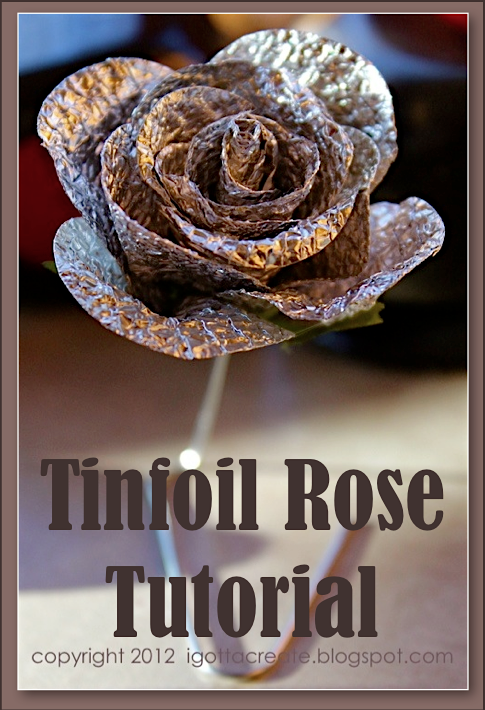 Who would think to make a rose from aluminum foil. :) Neat! I LOVE this beautiful rose! The aluminum foil is sparkly!! Thanks so much for sharing at Oopsey Daisy!! Another terrific tinfoil project! The rose turned out beautifully! Great job...love your creativity. Thanks for sharing it! So cute:) Thanks for sharing . Hi Cristina! Stopping by from What we wore and made wednesdays link party. That rose is amazing! I love it! And it seemms quite easy to make, I'll have to try this! Sooo cute!! I love this idea~ sharing it at the party tonight- thanks for linking up at Feathered Nest Friday! Wow, Christina!!!! This rose is beautiful!!!!!!! I love it!! Some people are so creative! Thanks so much for sharing at Fabulous Friday at Faith, Trust, & Pixie Dust. This is so pretty! And super creative! 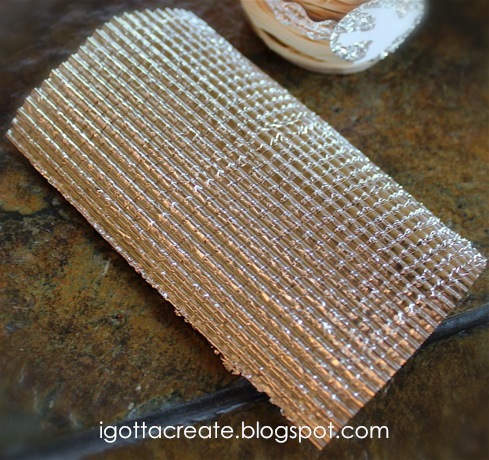 I love using tin foil, so when I saw this in the American Crafters lineup I just had to click on it! Beautiful!!! You are so creative!! Such a great project. I found you over at Centsational Girl. I never knew so much could be done with aluminum foil. I am your latest follower. Hope you will stop by and consider following me back. Thank you for much for your lovely comment! You have such a fantastic blog, what a creativity! And love your beautiful rose, it's such a beauty! Thank for sharing! I'm pinning right now!